Every day a group of performers take the streets of Old Havana by storm. Dressed in colorful costumes, they dance to the contagious rhythm of the conga. On their daily route, these colorful street performers stir the city into action. They’re like a wakeup call, a reminder that this is Cuba. 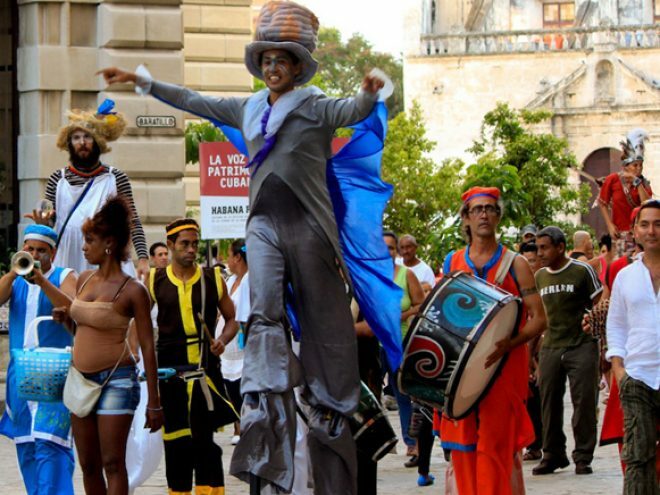 Gigantería, which is the name of this street theater ensemble, is a group of friends who have joined the City Historian’s Office in its efforts to preserve the culture and traditions that define Cuba. They are rescuers of Afro-Cuban traditions and carnival revelry in the same manner that several centuries ago the people of the Villa de San Cristóbal de La Habana celebrated in the streets. The actual conga—the show—lasts barely minutes, but some people wait for it all day. Trumpets and drums arouse locals and visitors from the drowsiness caused by the relentless sun. The sound is contagious. The children need no invitation and dance along with the stilt-walkers. Adult Havana dwellers do not lag behind, as well as many tourists who dance along with the Habaneros. The group was born on the street and is today a social reference of their art. They have shared their experiences seeking to keep the work they do alive. They train constantly to ensure that all the members of the group master the art of stilt-walking, and have also taught the rudiments of this technique to over 50 people. Although their regular stage is the streets of Havana, the group has performed in marginal neighborhoods and in disaster areas when hurricanes have hit the island to bring joy to the less fortunate. The stilts were the trigger for their first street performances, but over the years, they have included other acts, like juggling with balls or clubs, skills with fire and clowning. Managing to turn passersby into audiences, drawing attention to their art, making use of different spaces and transforming obstacles into mediums for their theatrical performances implies a constant artistic enrichment as well as great challenges. The group has grown in the street, from the street and for the street and this is undoubtedly one of its strengths.